It was really bad not having a voice. Never take anything for granted, never...So, big deal you might say, 'at least you were not coughing, you didn't have a fever,...you were fine otherwise'. Yes! And that was the problem. I tried to go shopping and had to write everything down in my little blue notebook for the deli guy. At the cash register I pointed at my throat and mouthed a "hello, how are you?" just to hear the girl say "excuse me, what did you say? what is wrong with your voice? ".....ahhhh pleeeaaase!! Having to stare at the caller i.d while fighting the urge to pick up when friends would call. Relying on text messaging and emails (I type faster than I can text. message so I had to drop the former) to communicate with the world. It was all a little too uncomfortable...even if I tend to be the quiet one. The connection with this dessert? Since I had to be on complete voice rest for 3 days, I figured the easiest way to do this was to stay put, away from talking temptations. I spent more time at home enjoying the pier, walking the dog on the beach, baking and doing some craft projects. I found myself being inspired by this book and got started on simple Panna Cottas and this is where the rest took place: I am not trying to get all fancy on you but I had time on my hands to bake and guild the lillies and so I did more than just Panna Cottas and I still have 4 of them in the fridge and still no where special to go. With a spatula, incorporate the almond/sugar with the egg whites, taking care not to break and deflate the whites too much. Add a few drop of red coloring to intensify the color. Combine flour, sugar, baking powder ad water in a bowl until smooth. Dip bananas in fritter batter. Roll in breadcrumbs. Deep fry until golden brown. Combine zest, juice and sugar in a small saucepan on the stove and bring to a simmer. In a separate bowl, whisk the egg until light. Beat some of the hot blood orange mixture into the egg. Scrape the egg mixture back into the saucepan. Cook, stirrring constantly and reaching all over the bottom and sides of the saucepan. Continue to cook and stir for 15 seconds. Pour through a strainer set over a bowl and cover with plastic wrap to prevent forming a skin, allow to cool before use. Whip the heavy cream to stiff peak with the powdered sugar. Gently fold the cream into the blood orange curd with a spatula. The weather has been so nice and warm (upper 70s) that this was a great dessert to share with a loved one. The flavors really went well together and the fritters are so light, makes you want to go for seconds...or thirds! After our baking group adventures into rich dark and buttery flourless chocolate, I wanted to take it easy...which for me means making dough and kneading bread. I prepared a Danish dough last night and assembled them this morning while a couple of brioche were taking it easy rising on the countertop. You could say that there is nothing grand about a danish but if you ever had one fresh right out of the oven I know you would disagree (unless you dislike them of course). 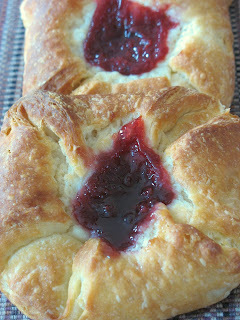 That buttery and flaky goodness, topped off by a dollop of cream cheese, jam or frosting...Mmmm! That's how I like my morning: sweet, soft and looking like a pillow. I thought about using my usual Danish dough, but I had bookmarked another one weeks ago so it was great timing to give it a try. If you have not visited Gattina's blog yet, go...no run...move those little fingers across the keyboard fast and enjoy...The girl knows her dough! This particular version attracted me because of the way the butter is incorporated, not as a block and then tucked it, but dispersed throughout the dough. Hey! I said I like my sunday mornings easy, didn't I?! Dissolve the yeast in lukewarm water and let stand for 5 minutes. Stir in cream, salt, eggs and sugar . Add the yeast mixture into flour mixture, combine carefully with a big rubber spatula, the mass is just moistened enough and hold together. Cover, refrigerate 4 hours or overnight. Lightly flour the work table, turn out the chilled dough, pound and flatten to make a 16 - 20 inch square. Fold into thirds making 3 layers. Turn dough around and roll out again. Fold from the short sides into thirds. Rest in refrigerator for half an hour, repeat folding and rolling one more time. Wrap and chill the dough 30 minutes or overnight before you proceed pastry making. Cut the dough in half and working one portion at a time (refrigerate the unused one in the meantime), roll the dough to make a 12X9inch rectangle. Cut out 3 inch squares. Fold the corners of each square toward the center and make an indentation with the back of a spoon. Cover with plastic wrap and let rise for about 45 minutes. Ice if desired with a mixture of owdered sugar dissolved in milk. As I said: Mmmmm! No icing necessary! The flavor and taste of this cake is heaven, but I know I will probably go to hell because I am lusting after a cake.... It is facing me...sitting pretty...there....chocolaty, bittersweet, all glazed up, all dressed up...and it is too early for cake... But I think my throat could use a little love right now....and I need to take my meds with food....See what a simple flourless cake does to your head?!!! After our croissant making weekend, our little baking group decided to go for a slightly less time consuming dessert and we settled on a flourless chocolate cake. There are as many ways to make a flourless chocolate cake as there are ways to bake them. I have some before where egg whites were beaten stiff then incorporated into the chocolate mixture, most of the time with very little butter and you end up with a very light almost meringue like cake. Not this one! My arteries kinda screamed a little when I looked at the ingredients: 3 sticks of butter, 6 whole eggs...oh! Wait! There is actually 8 ounces of Antioxidant Powerhouse dark bittersweet chocolate so I should not feel so bad!!! Even more if you count the glaze...why worry?! Worried I became last night when I pulled these babies out. The original recipe calls for baking the cake in a 9 inch pan in a water bath. As I went to get the pan out of the cupboard, I figured I could try to make some demi sphere or pyramid cakes with the silicon pans I had, and pour the remaining batter in a 6 inch pan. The recipe is a breeze to make, seriously...I did not use the recommended chocolate but Lindt 70% bittersweet, and a dip of my fingertip in the prebaked batter gave me confirmation that this cake was going to be intense. I baked the cakes, let them set to cool and then I could not wait any longer and cut one...and then the worrying begin. Let me explain: the taste was awesome, but the texture did not appeal to me. I don't like puddings that much and that's what it was, 20 minutes after sitting on the counter top....Normal I thought, I am sure that a good 6 hours in the fridge is going to concentrate all of that.. Around midnight last night, I was still up reading and decided to go ahead and make the glaze. The little spheres looked so good...They seemed a little heavier in my hands, as if they were "fudging up" so my worrying was going away. Since I can't talk, I can't teach my classes or train my clients, so I have plenty of time on my hands...something I am not used to...but took the opportunity to play around with the dessert and give justice to its name by dressing up a little. I added caramelized hazelnuts, hazelnut and cocoa nibs praline and banana chips. Thank you Mary for putting the recipe up. Head over to her blog to get the full lowdow and go check out what my other talented and witty partners in crime have created! Fix a toothpick into each hazelnut. Cut a large block in styrofoam or use a sturdy piece of carboard. You will fix the hazelnut on it after they are dipped in the caramel. On medium high heat, melt 100 gr. sugar to a light amber color. Add the remaining 100 gr. sugar and stir and cook until deep amber. Stop the caramelization by setting your saucepan in bowl filled with ice and water. Wait 30 seconds for the caramel to thicken a bit and dip the hazelnuts. Fix each on the styrofoam and invert it on the edge of your countertop with a pan underneath to catch the sugar. I have got an easier way by inverting the styrofoam on the edge of the open dishwasher so that any piece of caramel is washed away next time I turn it on. Over medium heat, re-heat the caramel you have used for the hazelnuts until liquid again, Quickly stir 1/4 cup chopped hazelnuts and 2 Tb. cocoa nibs. Pour on a parchment lined baking sheet. Allow to cool completely and break in pieces. Puree one banana in a food processor until completely smooth. Cut out stencils in plastic or heavy paper. Line a couple of baking sheet with silicone mats and pour some puree into each stencils. Remove your patterns, sprinkle a bit of granultated sugar over the shapes and bake at 200 degrees F. for 40 minutes. No, no, you read right. I am not speechless for scones, I am voiceless. Apparently there is a new strain of allergies out there that cause people's vocal cords to become so irritated that they become voiceless. Right this minute I am staring at a lovely cocktail of different medications supposed to make me feel better in the next 48 hours. In the meantime I am required not to talk...I am on voice rest until monday. You would think that such a situation would prevent me from eating or wanting to eat...Nope! Seems like my body has a way to accept food no matter how sick I am...Yippee!! I don't have much of an appetite actually but the only thing I wanted this morning was a fresh hot batch of scones... and I knew exactly where to get them. 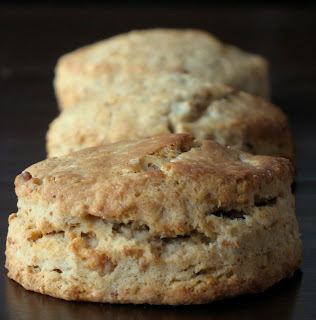 I have fallen in love whith every scone recipe I have found in Dorie's book. They are so satisfying, tender and moist that they can make anybody feel better instantly.... B. provided me with a small pad on which to write so I would really follow the doctor's orders and I could only come up with "Mmm..Mmmm...Mmmm. Hands off!" If you feel really bad, these will make you feel really good. That simple. They were delicious plain, still hot right out of the oven. They were even better with some Coconut Honey. Finely grind the nuts in a food processor with the sugar. Stir the egg, cream and buttermilk together. Combine the flour, ground almonds, baking powder and salt together in a large bowl. Add the butter and with your fingertips or a pastry blender mix the butter into the dry ingredients until the mixture ressembles coarse crumbs. Pour the liquid ingredients in the bowl and stir just until the dough comes together. I usually do everything by hand but you can use a fork.Gently and quickly knead the dough and turn it onto a floured board. Roll out the dough to about 1 inch thick and cut out desired shapes with a cookie cutter. Place on a parchment paper lined baking sheet and bake for about 20 minutes. How do I feel now? Better but quiet. All that silence...! I sure I am glad I have not lost my tastebuds! I can see you ..eyes wide open wondering if I have gone mad...Soup? 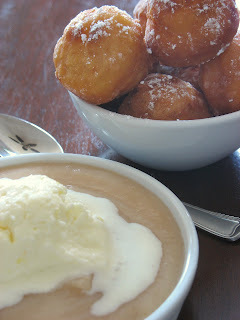 On a dessert blog....Well, what if I whisper Sauternes Poached Peach a la Herme, Luscious Lemon Ice Cream via Lori Longbotham and Ricotta Lemon Beignets thanks to Richard Leach....would you keep on reading? I am going to take a chance and assume yes. What if I add that all these found the way to make a beautiful sweet dessert soup....do you think you would want to know more....? The February I remember was cold, rainy, grey and magical. It was the perfect time of the year for hot chocolates, hearty stews and soups. My mom made sure that every meal during the winter started with a bowl of vegetable soup, a few croutons and a dash of cream were sometimes added to make it special. I remember my grandmother making me a weird concoction when I was sick: milk and alphabet pasta soup. Most of the time I'd only take a few spoonfulls and leave it aside, it was not that flavorful. All this ended the day my grandfather added a couple of spoons of sugar...and the medecine went down... A sweet creamy soup is the best when your throat kills you, your eyes are red and your nose is numb... That moment of my life was the inspiration behind this dessert and so were the three pastry shef mentionned above....what an eclectic cast! Two of the components of this soup can be prepared ahead of time, over several days except of course for the beignets. By the way, I realized after making those that today was Mardi Gras, how appropriate! I guess that 30 something years of celebrating that day somehow has become part of my being (or is in my DNA). The soup is served warm, not hot which provides a great contrast to the lemon ice cream. Use the beignets just like you would bread and soak up every bit of it. In a large saucepan, combine all the ingredients and simmer for 30 minutes, or until the peaches are cooked through. Remove the fruits from the liquid and let cool. Remove the skin and puree in a food processor. Set aside until ready to use. Bring the cream, half and half, sugar, honey and zesr just to a boil in a saucepan. Stir to dissolve the sugar. Whisk the egg yolks in a separate bowl. Slowly temper them by adding the hot cream in a slow stream. Add all of the cream to the yolks and stir until blended. Return the mixture to the saucepan and cook over medium heat until it thickens. Stir constantly. It is ready when the cream coats the back of a wooden spoon. Do not allow the cream to boil. Remove from the heat and let cool. Add the lemon juice and stir until incorporated. Refrigerate until completely cold and process in an ice cream maker. I did have my ice cream container ready so I poured the custard in a large bowl and froze it. I took it out after a couple of hours and give it a whirl in the Kitchen Aid. I did that twice and achieved a really nice, smooth and light texture. Combine all the ingredients except the lemon juice, oil and confectioner's suagr in an electric mixer and mix until well incorporated. 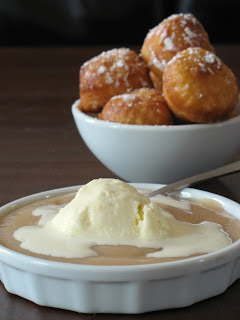 Heat oil to 325 degrees and deep fry the beignets using a small ice cream scoop, until golden brown. Drain on paper towels. With a spoon, drizzle some lemon juice over them and dust with confectioner's sugar. 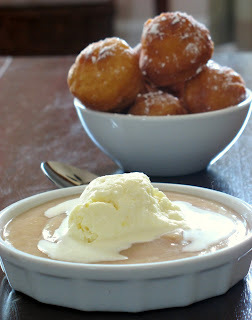 Heat up the peach soup until warm, scoop some ice cream on top and serve the beignets alongside. I am not the only one to think February is Soup Month: head over Alanna's A Veggie Venture and add your favorite recipe to the lot. I figured I could contribute a sweet one and trust me this one rocks! I also would like to dedicate this post to Yvonne, my favorite Cream Puff, for making me a fabulous cake. You made my day! Some might say I am obsessed, some might say I am crazy, some might add I have gone wild...I will just call myself smart: when your grocery guy hands you a case of lemons at half price, you just buy it... He does that trick once in a while. I fondly remember 2 cases of pears I worked my way through a couple of years ago when I was a the restaurant. The pear special of the week quickly became a joke between the waiters and me...but I disgress. Back to yesterday when I brought my Precious (insert Lord of the Ring voice here) cargo home. I had to start somewhere and since we love our relaxing Sunday brunches, I made these little puppies. 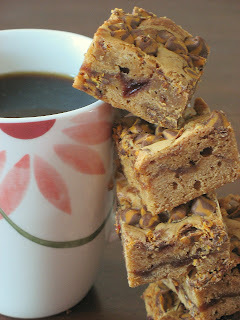 They turned out super puckery thanks to the couple of changes I made to the original recipe. I use the base a lot in baking muffins as it allows for number of additions such as fruit zests, dried fruits, nuts, etc... I don't know why or when I started dipping my muffins in a mixture of butter and sugar when they come out of the oven, but it adds a little dimension to a plain muffin. No matter what is inside your muffin, you can dip nut mufins in a mixture of melted butter, cinnamon, cardamom, pumpkin pie spices, fruit muffins in melted butter and lemon juice. Always sprinkle with granulated sugar and allow to set. One of our favorites is a plain muffin dipped in a combo of spices that make them taste like donuts. Preheat the oven to 350 degrees F. Grease a 12 cup muffin tin, or line with paper liners. In a large bowl, mix together the yogurt, oil, lemon juice, egg, and, if using, lemon extract. In a separate bowl, stir together the flour, 3/4 cup sugar, baking powder, salt, and lemon zest. Add the wet ingredients to the dry, and mix until just blended. Spoon batter evenly into the prepared muffin cups. Sprinkle remaining sugar over the tops for decoration, if desired. Bake for 15 to 17 minutes in the preheated oven, or until the top springs back when lightly touched. Cool muffins in the tin on a wire rack. Dip each muffin in the lemon juice, butter and sugar. Let set. A few days ago I was reading Is My Blog Burning when I came across this event held by Elena at Experiments , and even though I am early I think these muffins would be a great way to start the day on Monday. Be afraid people, be very afraid...there are tons of recipes I am already dying to try! My package did not arrive alone as I found a V-Day card from Arfi at HomeMades...the card is upstairs, I am not, so as soon as I get my behind upthere I'll take a pic, but in the meantime you can look it up here. It was the most unexpected yet hilarious card received...Thanks Arfi, you made me feel special! 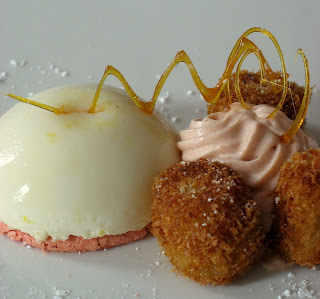 Keeping with the Valentine Day Theme (just to bug Brilynn), check this dessert: Sweet Dreams. The pastry chef works in one of the upscale restaurant in Charleston, and I admire her dedication, especially in our town. No, Pierre Herme was not my Valentine yesterday (not my type), and no he did not serve us in person...but yes there was Herme on the menu for my sweet love. I worked late last night training clients, (funny how women want to sweat and lift weights a few hours before eating chocolate...me I'd rather pop the Champagne open! ), so we ordered our favorite Indian foods and relaxed. The connection with P. Herme in all this? 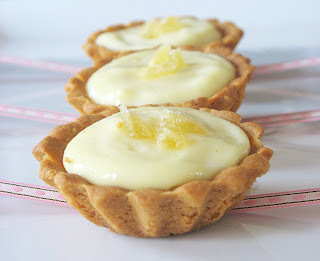 While making scones last week, I flipped Dorie's book open to "zee" famous Lemon Tart prepared by the French master. 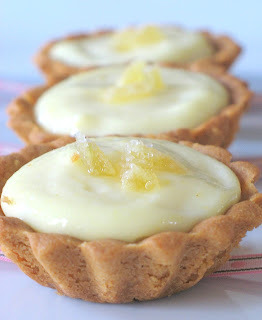 Her crust, his lemon cream...now if that does not scream "success" I don't know what does! I have made lemon or citrus curds and lemon tarts and other lemony sweets before but I had been putting this one off mainly because of the 2 sticks of butter it called for. After Carol declared Pierre Heme's Tarte au Citron to be best she tried around Paris, Valentine's Day around the corner and our mutual love for citrus, I had plenty of excuses (or opportunities) to try my hand at it. The result? It is by far the best lemon cream tart I have ever had, thank you Pierre! The flavor and intensity of the cream develop over a couple of days so this makes it a breeze for the cook to prepare ahead of time, but they are best assembled at the last minute. In a food processor, pulse all the dry ingredients. Add the butter and pulse again. Add the egg yolk and pulse until the mixture comes together in a ball. Wrap in plastic and refrigerate while you prepare the filling. Roll between sheets of plastic wrap and cut out circles larger than your tart shells, fit the dough into the molds and cut out the excess. Bake at 350 for about 10-15 minutes or until golden brown. Because the dough has a tendency to puff up, I take the shells out halfway through the baking process and pat the bottoms flat with the back of a spoon. Make a water bath by putting a saucepan of water over heat to simmer and placing a metal bowl over, without the bottom touching the water. Rub the sugar and lemon zest with your fingers and add to the metal bowl. Whisk in the eggs and lemon juice. Cook the mixture over the water bath, whisking constantly until the cream reaches 180 degrees. It can take up to 10 minutes. Once the cream reaches 180 (your whisk will leave ribbon tracks in the cream),remove the cream off the heat and put it into a blender. Let the cream cool to 140. Add in the butter and process until perfectly smooth. Pour into a container, cover and refrigerate until ready to use. Assemble the tarts by spooning the cream into the refrigerated tart shells, and decorate to your liking. I added pieces of candied ginger. You know, all the seduction amunitions: cream, butter, sugar, ginger...! Because of all the sweetness and love surrounding this post, it is also my entry to this month SHF, hosted by Jasmine. Allright, it is true that we don't do anything special on February 14th because we have always refused to buy into the whole money making scheme it has become and feel that we don't need a special day to remember to say and mean "I love U". We do express it in so many different ways throughout the year, but I still like to treat myself to a little pre-Valentine dessert. I usually follow my craving of the moment and lately it has not been chocolate (shocking I know!) but berries and citrus. Valentine's Day is also an occasion to express my love to my family and friends. 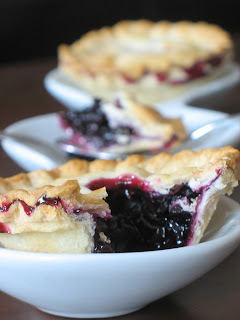 Since my dad loves Tarte Aux Myrtilles so much and I do too, I made a couple of little Blueberry Pies. I believe we will have them with Champagne tonight...don't worry I won't forget to make another treat for my sweetheart tomorrow. This is another one of those recipes picked up at the Restaurant and that evolves and changes everytime I make it, but here is what I did this time. Since I like pastry dough, I made these double crusted which qualifies the little things for this month WTSIM, hosted by Jeanne. Roll out the dough and cut 8 circles 1 or 2 inches larger than your tart molds. 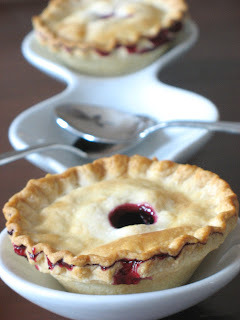 If you do not have free standing tart molds, you can use muffin tins. Gently put one circle at the bottom of each mold, divide the filling evenly among the tarts and lay a second circle on top. Trim and flute the pies the way you like it. I cut a whole at the top using the bottom part of a pastry tip, before I lay the top crust. If you forget, cut a couple of slits with a knife on the top crust. Put the tart shells on a baking sheet and bake at 350 for about 20 minutes or until golden brown. I like to brush mine with a bit of milk before baking. These bars are nothing elaborate but they are plain comforting good. I made another kind of scones this morning (I go through phases) and while looking for some almonds I found an almost empty jar of raspberry jam and a bag of peabut butter and milk chocolate chips. I don't usually get these but I remember B. sneaking them in the shopping cart because "they would be good melted on toast"....bad bad man!! My neighbor asked me last week to make some treats she could take to the twins' teacher and wanting to change from the usual brownie or cupcake (nothing wrong with them, mind you), I had made a batch of white chocolate and raspeberry jam bars, aka "Razz-Ma-Tazz Bars". They were easy to make, traveled well, and something she could totally pass as her own....Yes, some people have ghostwriters, she has a ghostbaker....! They smelled so good that it took everything to prevent my cookie monster of husband from eating some before I could get the pan to her house. I promised him I would make some this weekend. We were rather in a childish and playful mode this morning that I figured making peanut butter and jelly bars would be a great accompaniement to our regressive pinball marathon with the computer. I took the above mentionned recipe and tweaked it for PB&J lovers figuring if it worked it would be childlike comfort and if it failed we would hide it under ice cream and call in sick tomorrow...Well, we will go to work tomorrow, in the meantime we might have a stomach ache from eating too many of these! Preheat oven to 325° F. Grease a 9-inch-square baking pan. Melt butter in medium, microwave-safe bowl for 1 minute; stir. Add 1 cup morsels; let stand. Do not stir. Beat eggs in large mixer bowl until foamy. Add sugar; beat until pale, about 5 minutes. Stir in morsel-butter mixture. Add flour, salt and vanilla extract; mix at low speed until combined. Spread 2/3 of batter into prepared pan. Heat jam in microwve for 30 seconds. Spread on top of the base. Cover with the remaining batter and sprinkle the reamining cup of morsels on top. Bake for 25 to 30 minutes or until edges are browned. Cool completely in pan on wire rack. Cut into bars. Warning: this post is about love! I like to give my man a little extra attention in the morning because it is truly the only time of the day we can spend "uninterrupted"...you know how it goes, work, hobbies, friends, functions, for some kids and others pets, and before you know it the day is drawing to an end. I was getting tired of our breakfast selections so when I saw Meeta's invite to her Monthly Mingle, I figured it would be a great way for me to show B. my love and appreciation with one of his favorites, scones. I felt bad the recipe called for heavy cream and butter so to alliviate any guilt I added dried cranberries...it's good for the heart! B. could not stop humming his way through the house knowing that he had those waiting for him this morning. After over 8 years of marriage, I am blessed by the fact that he thanks me for every meal or special treat I set out in front of him... I thank him for still opening the car door for me and making sure my tank is full. We are romantics in our own and geeky way. 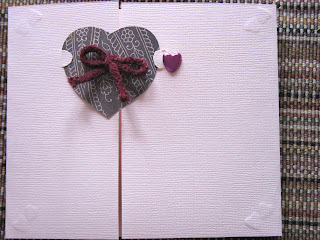 For example, we have a V-Day card contest every single year: who will be the one to give the most Valentine cards, romantic, funny, creepy, dorky, homemade,.... I think I went a little crazy this year...we'll see! 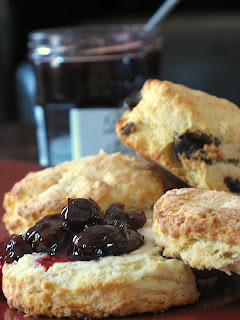 Big silence of approval from B. regarding these scones and he asked for another batch next week...my heart can't say no! In a small bowl, whisk the cream and the egg. Set aside. In a separate and larger bowl, mix the dry ingredients. Cut in the cold butter with a pastry blender, 2 forks or your fingers (my choice, I like to play with food), until it resembles coarse crumbs. Add the cranberries. Mix in the wet ingredients and mix thoroughly with a spoon or again your hands. Do this fairly quickly to avoid over kneading the dough. Gather into a ball and pat on a sugared board. With a 3 inch cookie cutter, cut out 8 rounds. Put them on a foil or parchment paper lined baking sheet and bake until golden brown. Note: I like rolling the dough with sugar on my board and not extra flour. 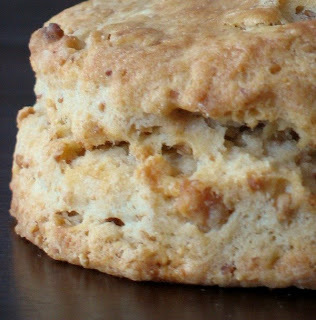 It coats the scones with a light crunch and prevents the dough from getting tough. I don't think I have confessed this here yet, but we are Nutella fanatics...us and about 95% of the world! On toast, croissant, brioche, scones, with a spoon, knife, fingers and when gone camping without utensils, with the other end of your toothbrush...never say never it might happen! 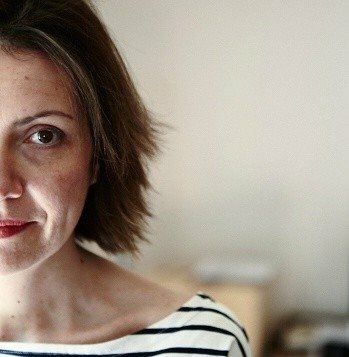 I remember letting out a little (ok, an over) excited "yes" when I read about Shelley and Sara co-project to celebrate Nutella Day and spread the love by including other bloggers (round up on the 7th). No way, I'd miss that! I was reading one of the (many) magazines I brought back from France when I found this recipe and was first attracted by the picture, especially given my recent falling in love with everything in pretty glasses. I thought "hmm, wonder if I could do this cream with Nutella..", well duh! 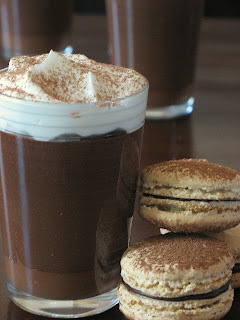 The recipe was for a "Creme au Nutella", I did play around with it and added whipped cream and a few macarons, you know, just for good composure! Well, actually the recipe for the cream calls for only egg yolks so you know what I am tempted to do when I have leftover whites! In a heavy saucepan, heat 2 cups of cream to boiling point. Remove from heat and stir the chocolate and Nutella. Let stand for a couple of minute. Stir until fully incorporated (like a ganache). In a separate bowl, whisk the egg yolks with the sugar until pale. Slowly stir the chocolate mixture whith the yolks and sugar. Return to the saucepan and cook over low heat until thickened, about 5 - 8 minutes, much like a pudding. Do not let this boil.Pour the cream in glasses or dishes and refrigerate at least 2 hours. When ready to serve, whip the remaining cup of cream with the powdered sugar until soft peaks form and divide among the glasses. In the meantime, in a saucepan on high heat bring the water and sugar for the syrup to 230 F. on a candy thermometer.Slowly add the boiling syrup to the egg whites and continue to whip on medium - high speed until they are completely cooled and you have a shiny meringue (10-15 minutes). Heat 1/2 cup of heavy cream to boiling point. Remove from heat and stir in 3/4 cup dark chocolate and 2 Tb. Nutella. Let stand 2 minutes. Stir until well incorporated. Refrigerate until of spreadable consistency. Fill the macarons shells ... and eat! I really did not want to call these by their "real" name because of the ill sound it produces in my ear everytime I serve them to guests. They are "lemon sauce puddings"...uh...they are more like a cross between a mousse, a curd and a fallen souffle. 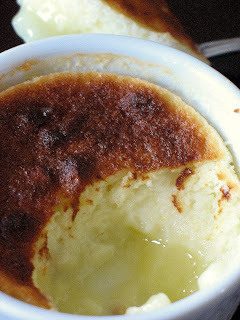 They rise a tiny bit once in the oven, the top layer is a perfect tender mousse and when your spoon reaches the bottom you scoop out a nice lemon sauce/ curd. 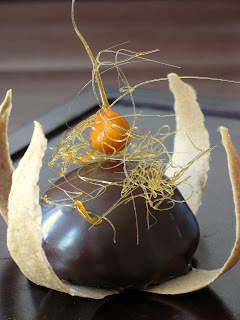 There are many versions of this dessert and the night I made these for guests, I noticed that Lisa posted one of them. Sift together dry ingredients and combine with yolks. Add in milk, lemon juice and rind. Fold in beaten egg whites. Spread batter in bottom of 4 ramequins and place baking dish inside a larger baking dish or roasting pan. Fill outer pan with hot water until the water comes halfway up the sides of the pudding dish. Place whole contraption in the oven and bake for 35 minutes. This is the second edition of this postcard exchange organized by the lovely and talented Meeta. It is extremely difficult to find a Valentine related postcard and since I make my own greeting cards, I decided to create this one for....sorry can't say...! Let's just say it has to travel some miles and a few ponds....! Life has a way of getting in the middle of one's best laid plans and I apologize if it took me a while to blog about it, the card was actually sent last week. Seeing my desserts through a lens, becoming the "director of photography" of my own baking ( and I say that in the lightest way possible, wink! )...I would have never thought I would enjoy it so much, live it so much and want to learn from professional food photographers. That's why I have always refrained from answering readers' questions about food photography, (vast and subjective topic) but when Leemei from My Cooking Hut asked if I'd be interested to write about my experiences as a food blogger-photographer, I figured it was a sign I needed to sit down and do so. 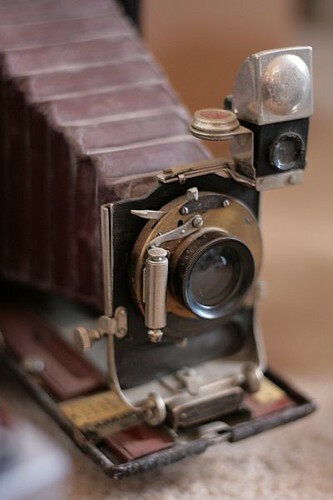 We all blog differently, we all photograph differently and we all think about it differently, but in the end we all try to do something that is enjoyable and fulfilling for where we are at that moment in our life. Since some of you asked, I hope that you will take this guest post as it is: an account of my experiences and doings in "dessert photography" and not as a "photo 101". I leave that for the books and the pros, who will always be my source of inspiration. Click for the photography guest post. Thank you Leemei for the opportunity! Makes about 18-20 depending on the size. Preheat oven to 300 degrees. 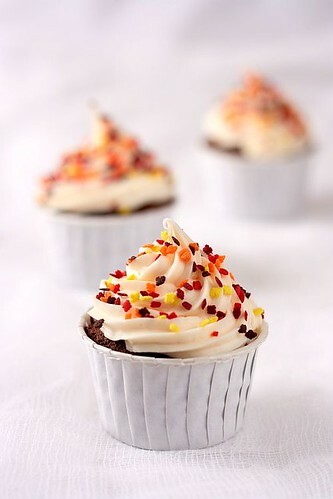 Lightly coat the inside of your cupcake wrappers with cooking spray. In a bowl, combine the chocolate and the hot coffee and let stand, stirring occasionally until the chocolate is melted and the mixture is smooth, about 5 minutes. Sift together the flour, cocoa powder, baking soda, baking powder, and salt. Set aside. With your electric mixer, beat together the eggs and sugar until pale and thick (about 5 minutes). Slowly add the oil, buttermilk, vanilla, and the previously melted chocolate mixture to eggs/sugar mixture. Beat until well incorporated. Add the flour mixture in 3 increments and beat until smooth. Divide the batter among your cupcake liners and bake for about 25 minutes or until a knife or toothpick inserted in the middle comes out clean. In the bowl of stand mixer, whip the egg whites until they have soft peaks. In the meantime, combine 2 Tb water with the sugar to a boil in a heavy saucepan and bring the syrup to 250F. Slowly add the sugar syrup to the egg whites. If you use hand beaters, this is even easier and there is less hot syrup splatter on the side of your bowl and in the whisk attachment of the stand mixer. Continue to whip until the meringue is completely cooled. Slowly add the butter, one tablespoon at a time. The mass might curdle but no panic, continue to whip until it all comes together. Add the cream cheese, the same way, a little at a time until everything is smooth. Whisk in the vanilla extract, or paste or bean. Keep it in the fridge up to 4 days or in the freezer for up to a month. 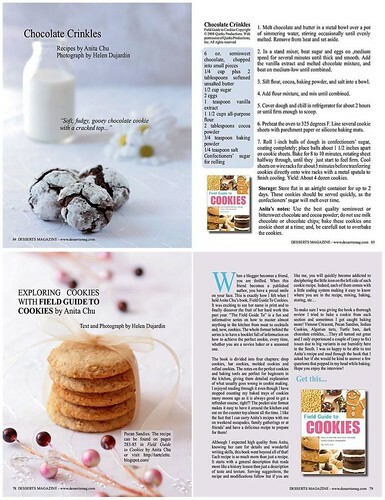 The second part of my interview with Anita for the release of her book "Field Guide To Cookies" is up in the latest edition of Desserts Magazine! 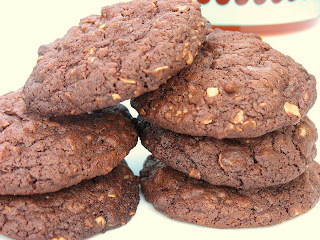 Watch out now....it's a whole issue of just cookies! Perfect for this month of gift giving. No, I don't get a cent for promoting the magazine, I just get excited when I see quality work and passion shared for food and baking in particular. Sharing....it's all about sharing. Now...go get Anita's book ok?!!! Having parted with the croissants after such a busy- frenzy -packed folding-rolling weekend (say 3 times fast), I needed something simple to bake and nibble on around the house. I brought back many books from France but I have not had the chance to sit down and really read them through so I picked up Dorie one more time because I was sure to find something homy and for which I would have all the ingredients on hand. So far her recipes have not failed me so my hopes were high and I have to say that one more time, she did not disappoint. 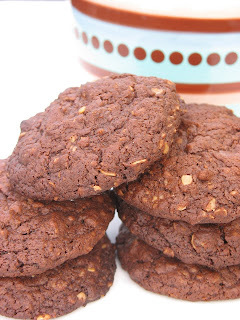 She describes these as "deeply and unswervingly chocolaty-closer to the chocolatiness of a brownie than of a cookie(...) a bit crips at the surface and oatmeal-and-brown-sugar chewy through and through." Could not have said it better. 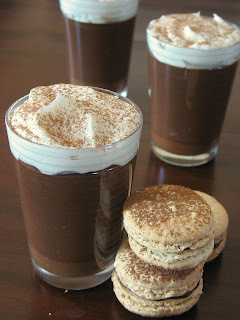 These are delicious and great for a chocoholic! Sift together the flour, cocoa, baking soda and cinnamon. Set a heatproof bowl over a pan of simmering water. Put the butter in the bowl and add the water, then the brown sugar and the chocolate. Melt on low heat, stirring occasionally. Don't let the ingredients get too hot, the mixture will remain grainy. Remove from the heat and whisk in the eggs, one at a time. Whisk in the dry ingredients, then the oats. Do not stir too much. 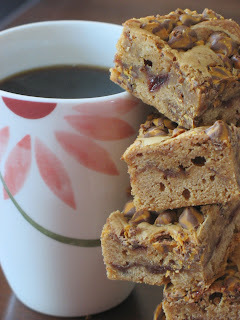 Drop by tablespoonfuls on parchement paper lined baking sheet and bake for about 12 minutes. Remove from oven and let cool to room temp. The soft center will harden once the cookies are out of the oven.